You play as a white star capable of manipulating gravity by attracting or repelling. Using only these two controls, you have to find the the blue planets on each stage and absorb them in order to make your white star grow. With each planet you absorb, your star gets bigger and gains the ability to make smaller planets orbit your star as satellites. Once your star has reached a certain size, an orange star appears and needs to be caught in orbit around you to clear the stage. 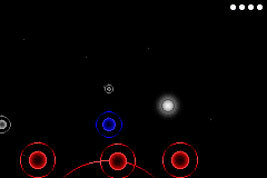 On later stages, asteroids unaffected by gravity and black holes appear as stage hazards.